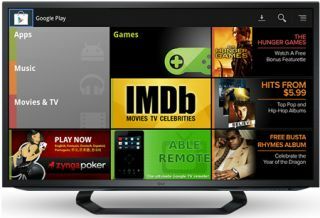 Google TV in the UK gets movies and music via Google Play | What Hi-Fi? Google has added music and movies via the Google Play store to the Google TV experience in the UK. Your Google TV box will now be able to download songs and films from the Google Play store, as you would on a tablet or smartphone, directly to the set-top box to enjoy on your TV and home cinema system. Google TV, developed alongside Intel, Logitech and Sony, has yet to set the world alight – not unlike Apple TV – but is nevertheless a fairly cost effective way of adding smart TV internet content to your television. Google TV boxes, such as the Sony NSZ-GS7, are available in the UK for under £200, and offer web browsing, apps and media streaming in a compact set-top box. The Sony box has its own Sony Entertainment Network, offering movies and music for a monthly subscription cost. Apple has struggled to make its Apple TV box an exciting proposition for mass market and continues to refer to the product as a 'hobby', which in Apple-speak tends to mean a product which isn't a huge sales success. Rumours have suggested that a new Apple TV box could include live TV as well as on-demand content.